At the end of August, we hosted a coaches and mentors workshop for FIRST LEGO League (FLL) and FIRST LEGO League Jr. (FLL Jr.) coaches and mentors. Recently, there has been an increase in coaches and mentors within the Cedar Falls School District, so the goal of this workshop was to help prepare them before their upcoming season. 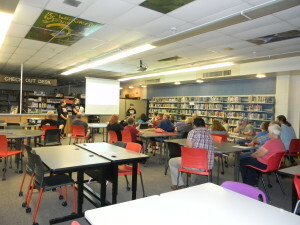 The workshop began with explaining specifics about what FIRST is, how to get grants and funding to help teams, and district policies for FLL and FLL Jr. teams, coaches, and mentors. Then, we broke into two groups: a group for FLL coaches and mentors and a group for FLL Jr. coaches and mentors. The FLL Jr. group covered what a Show-Me board is, what the LEGO model contains, the core values, and the responsibilities of a coach or mentor. 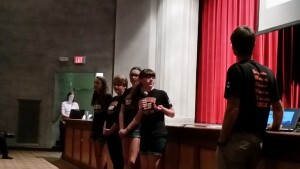 The FLL group covered the three parts of FLL (the robot, project, and core values), and what an FLL Regional Qualifier is. Camille Sloan Schroeder and Nicole Fannin from Iowa State University came to answer any questions coaches and mentors had about FLL or FLL Jr.